This is the final project for AI & Culture: Buildings & Cities class in the School of Design at Carnegie Mellon University. This idea is inspired by one of the talk about Google sidewalk labs project in the waterfront Toronto. While the idea of a smart city is kind of everyone’s dream, citizens are too optimistic about the vision and have difficulties to understand its negative implications. On the other hand, when it comes to data privacy, people suddenly raise many concerns about it. We believe that there is a gap between the bright shining future and the implication of it. 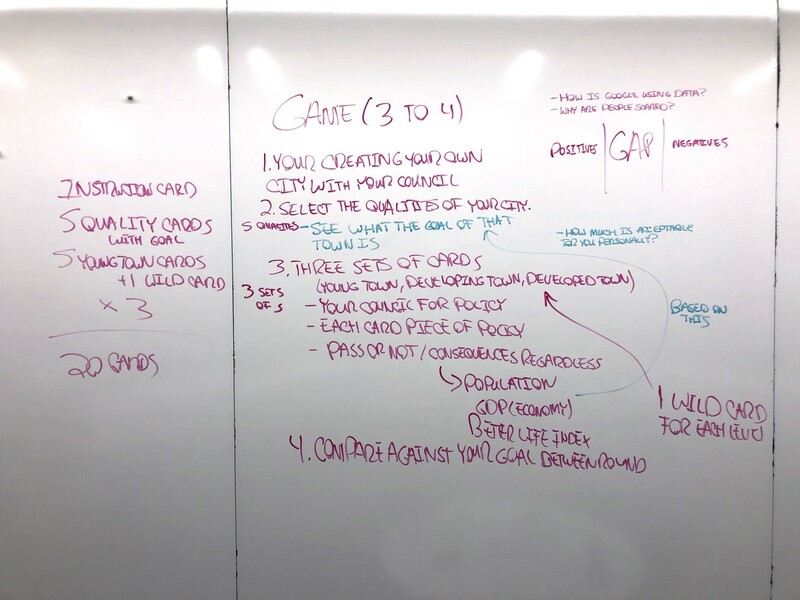 So we decided to design a game for people to have conversations about it. The goal of this game is to provide a starting point for city planner and citizens to discuss the pros and cons of the smart city proposals. 3 or 5 Players and 1 Host. Since the game use voting mechanics to decide whether to accept the proposal, the odd numbers of players are required so that there will be always tide breaker for the voting. 5 Young City Cards: Cards that contain the types of proposals a young city could receive. 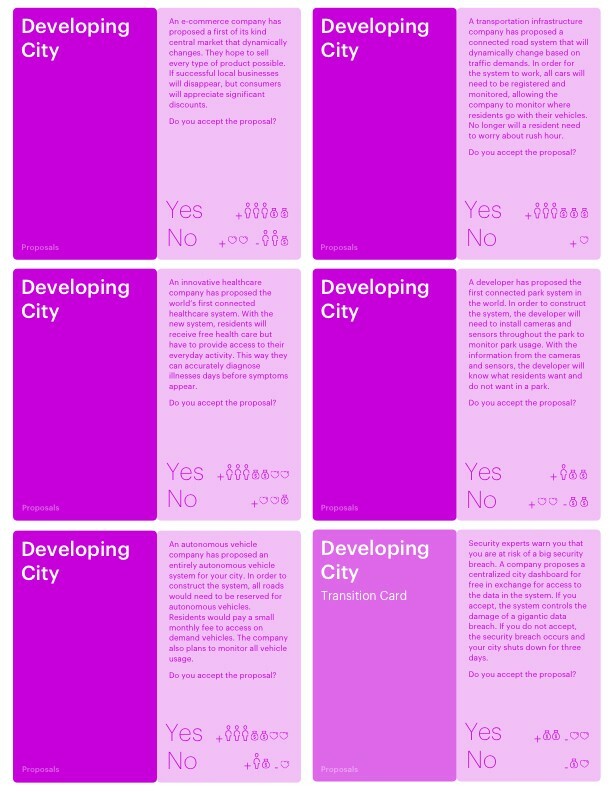 5 Developing City Cards: Cards that contain the types of proposals a developing city could receive. 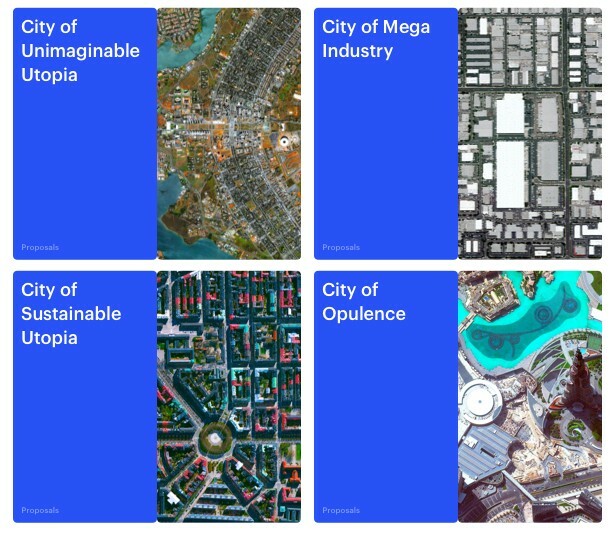 5 Developed City Cards: Cards that contain the types of proposals a developed city could receive. 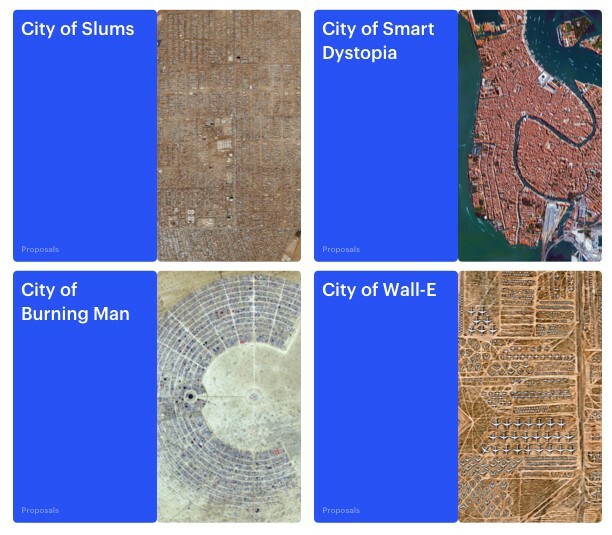 3 Transition Cards: For young city, developing city and developed city. 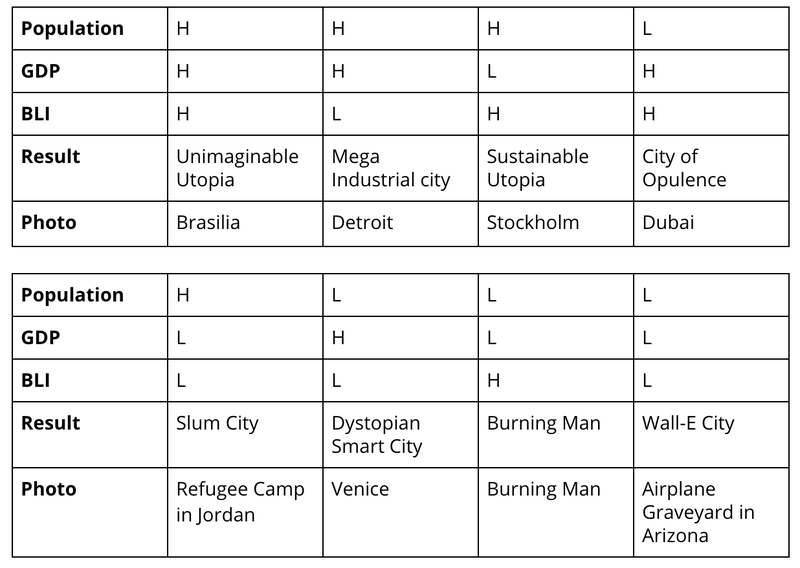 Result Matrix Card: Cards that help players know what city do they accomplish. Start with 3 to 5 players and 1 host. You must start with an odd number of players so that there is always a tiebreaker. Separate the cards based on their type. Shuffle each deck. Select a young city card. Have the host read through the proposal and lead a brief discussion about the pros and cons of the proposal. Players then vote for or against the proposal. After voting, the host will announce the effect of the decision and provide the corresponding tokens which are placed on the token board. Select one more young city card and follow the same process as in step 3 and 4. The stage of young city is finished, pick up the Young City Special card to follow the instruction. 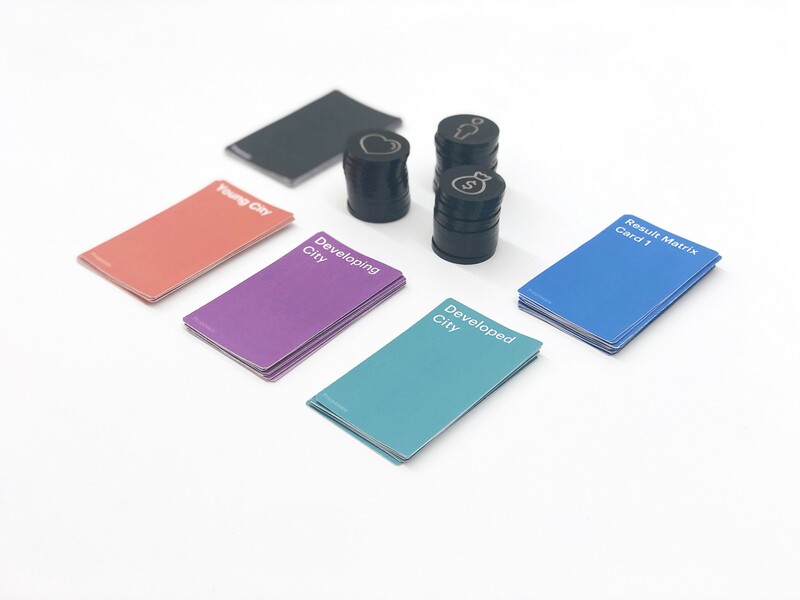 Complete the same process with two developing city cards and the special developing city card. Complete the same process with two developed city cards and the specially developed city card. The host tallies up your final tokens and references the result matrix card to see what type of city you have built. They then retrieve that card and show it to the players. Have a discussion as a group. Reflect on the cards you selected and the decisions you made. What were the most difficult considerations you made? What could have influenced you to reverse your decision on different proposals? H means the number of tokens is equal or higher than 5. L means the number of tokens is less than 5. People enjoy the discussion about the dilemma situation provided. However, some proposals seem to be too easy to decide. They are less debating than we expected. Although we design the impact of the proposals in a rational manner, we didn’t provide the rationale behind to the host to lead the conversation. Tokens work really well. Players are even eager to get those token. As for the final accomplishment, players enjoy discovering which city does the photo represents and why this specific city is chosen. It is a good opportunity for the host to facilitate the conversation. A more comprehensive discussion guide should be designed. We are able to use this game to facilitate conversation about the smart city and data privacy successfully. As I mentioned, there will be some minor point to be addressed in the future iteration. Another interesting point is that since we brought up the voting as a democratic mechanics in the game, it seems to embrace the possibility of tyranny of the majority. While players who strongly against the majority feel left over, they still strongly stand for their value. This is an unexpected consequence.